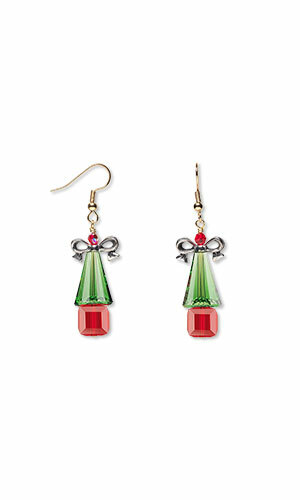 Create Christmas tree earrings in a flash with these easy-to-follow instructions and some Swarovski crystal Artemis, cube and round beads. Form a wrapped loop on the straight end of the wire. Repeat to create a second Christmas tree drop. Note: It's important to note the distance between the loop and the first bead and the number of wraps in the first earring; the second earring can be identical. Attach the loop on one earwire to the loop on one Christmas tree drop. Repeat to create a second earring.